It turned out to be a trip down memory lane for Ken Spiby and Stephen Thompson as we turned up to the airport to board the plane to Copenhagen to visit the Cityringen Project. Both had worked on the metro in the early 2000s and were keen to revisit some of their old haunts and check that their work was still standing! We touched down on a Thursday evening in January 2017 and made our way quickly through passport control before jumping on the train heading to Copenhagen Central Station. After checking into our hotel we met with a former LBA employee, Bahriye Yaman, who organised an excellent LBA trip to her native Istanbul in 2015 and is now working for Hochtief on the Nordhavn link. Together, we headed off into the night, eager to find somewhere Danish to have dinner. A nice relaxing walk around the streets of Copenhagen turned into a guided tour for myself and Francisco Gallego, where we wound up finding a nice Danish restaurant with a log fire to thaw out in front of. After enjoying some local food, beer, and sharing stories of past projects and colleagues, we said goodnight and made our way back to the hotel where we bedded down ready for the next day. After a disappointing Danish-pastry-free breakfast we made the walk from the hotel, through the city, to Kongens Nytorv station where we met Simon Taylor, head of tunnelling for Metroselskabet (the Client). Here we got an introduction to the project and a tunnel induction. The Cityringen project will form a new circular line in the city centre, following on from the success of the first line. It consists of a 15.5km twin running tunnel constructed using 4 EPB TBMs, 5.78m diameter with depths up to 25m below surface. A total of 21 shafts were also constructed for the 17 new stations, two of which connect to the existing Metro and two are for TBM drive sites. The geological conditions in Copenhagen create certain challenges, with the Copenhagen Limestone approximately 10-15m below the ground surface, which forms a critical lower aquifer. This underlies the Glacial Till which forms the upper aquifer. When finished and fully commissioned, the new metro will form a fully automated, driverless system which will operate 24 hours a day, with a minimum train frequency of 100 seconds. We entered the tunnels through Kongens Nytorv station and walked along the running tunnel northwards to Marmorkirken, where we walked up close to the surface. Here we could see the attention to detail in the design, with the opening to surface, which will eventually be glass covered, framing the church perfectly. 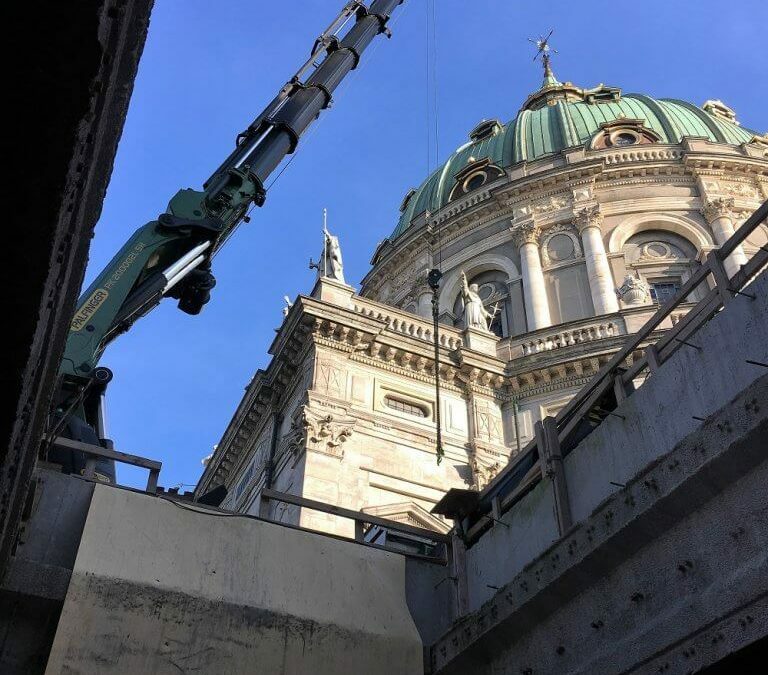 We then went down again and walked south back through Kongens Nytorv station, through Gammel Strand and Rådhuspladsen to the TBM, which was 250m from breakthrough. We arrived at the final remaining 5.78mID TBM which was halfway through the excavation cycle and navigated our way through to the driver’s seat. After watching the end of the shove and half of the ring build we made our way back to Gammel Strand, where the canal had been diverted to allow for construction. We exited and walked back to Kongens Nytorv on the surface above the tunnel alignment. After a quick debrief and an excellent lunch, we made our way on to the existing metro system where we got our first experience of the driverless trains. Very similar to DLR trains, they passed through well-lit tunnels, showcasing all the hard work. We arrived at the metro offices where a ‘Friday Bar’ was being held. This gave us a chance to chat to some of the guys about working on the project and Ken a chance to catch up with an old friend he didn’t expect to see! Before leaving Copenhagen, Ken and Stephen had to go and visit one of their biggest challenges from their time in Copenhagen – the transfer tunnel at Nørreport station. It was reassuring for them to see that it was still standing and (relatively) dry! Waking up on Saturday morning we enjoyed a quick breakfast before taking one last walk through Copenhagen to take the metro to the airport, with a pit stop at a bakery for a well-deserved Danish pastry (or three!) Big thanks go to Simon for taking the time to facilitate the visit and sharing his experiences with us.